The ASEAN-Japan Centre (AJC) conducted a "Follow-up Training Program on Interpretation” from February 27 to March 1, 2019 in Luang Prabang, Lao P.D.R, jointly with the Department of Information, Culture, and Tourism, Luang Prabang Province and GIZ (Deutsche Gesellschaft fuer Internationale Zusammenarbeit) *. This program was a follow-up activity of the training program on interpretation in Japan, which was conducted in November 2018, in Tokyo and Shizuoka, with the participation of the site managers of national parks/natural heritage sites and officers from national tourism and natural resources management offices from eight ASEAN Member States. Interpretation is a communication skill to help visitors understand and appreciate the value of tourism resources in the visited area. Better understanding on its value will lead to the conservation of the tourism resources and the sustainable tourism management. The AJC has been organizing programs to disperse the needs of Interpretation at main heritage sites in the ASEAN Member States, in order to achieve sustainable tourism in the region by utilizing their valuable tourism resources. Ten participants from the ASEAN Member States who joined the training in Japan last November further deepened their understanding on how to utilize interpretive methods to improve the tourism services/management of the heritage sites in their respective countries. 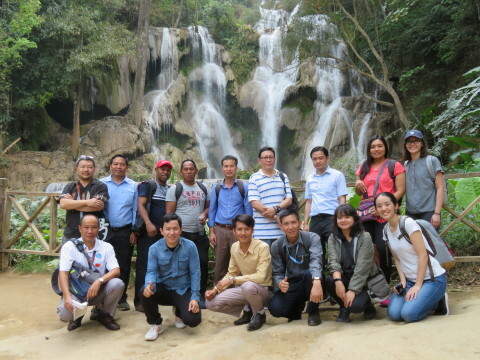 The training program included site visits to the UNESCO World Heritage city of Luang Prabang, a seminar, and training workshops facilitated by a Japanese expert. About 50 local tourism stakeholders in Luang Prabang, including provincial tourism officials, tour guides, tour companies, tourism association and trainers from universities/technical colleges participated in the seminar and workshop on interpretation. For most of the participants, it was their first time to learn about interpretation, and more than 90% of participants reported that they have gained new knowledge and deepened understanding on interpretation. Many tour operators who joined the workshop also reported that they would like to improve their tourism products using interpretive methods. One tour operator stated that “we will take advice from the expert and train our tour guides to help them boost confidence and provide more rewarding experience to visitors”. The program included the site visits to Luang Prabang Heritage City Walk and the Kuang Si Waterfall/National Park which are the major tourist attractions of the city. The lecturer and the participants discussed the techniques of the tourist guides using interpretive methods, and ways to promote the responsible tourism activities together with local communities. At the end of the workshop, all participants joined the group discussion to design eco-tour programs using the actual examples of the Luang Prabang area, where they received concrete advices and coaching from the Japanese expert to improve their skills in tour product designs. * GIZ implements a project called “Luang Prabang - Handle with Care” in Luang Prabang, Lao P.D.R.